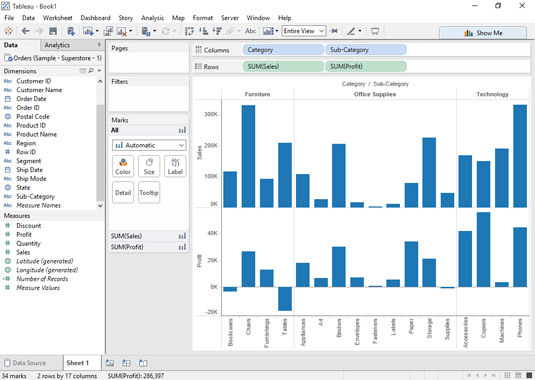 When you drag and drop something onto the Columns shelf, Tableau creates the columns of the chart. Exactly how the columns are created depends on whether you add a discrete dimension or a continuous measure to the shelf. As you can see, adding a discrete dimension to the shelf — in this case, the State dimension — creates a header with labels for each of the members of that dimension. Adding a discrete dimension to the view first will result in labels for the list of dimension members and automatically sets the mark type to text, as shown with “Abc”. Adding a dimension creates labels based on the members of the dimension. This demonstrates what happens when you add a measure to the shelf. In this case, adding the measure Sales creates a quantitative axis with a continuous range of values. The result is a bar showing the sum of sales along that axis. Adding a measure creates a numeric axis. By adding additional dimensions or measures to the shelves, you can add interesting elements to your view. For example, the image below demonstrates what happens when you add multiple dimensions to the Columns shelf after placing a measure on Rows. 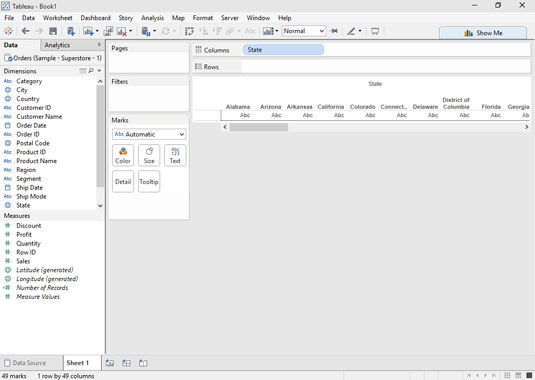 In this case, Sub-Category was added after Category so Tableau created a new header with labels to display each sub-category within its associated category. A second dimension adds a new header with labels. 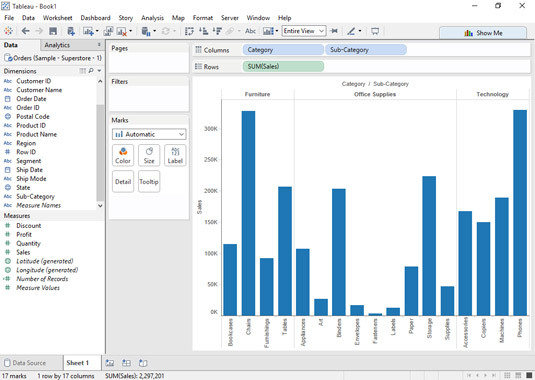 Adding a second measure to columns will create a new axis next to the first one, each in its own row. 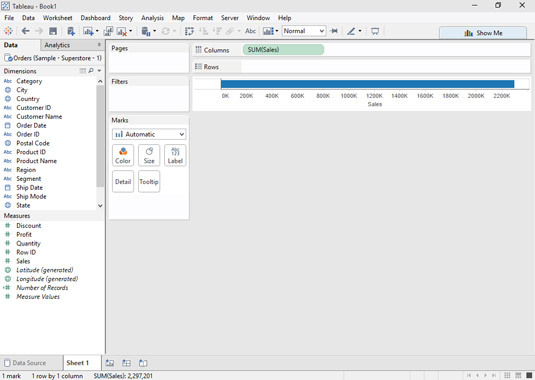 As you can see below, Tableau adds a second axis below the original and displays the results as two separate bar charts. If you want to add an additional measure to the same axis, you need to drop that measure onto the existing axis, rather than onto the shelf. A second measure adds a second axis.